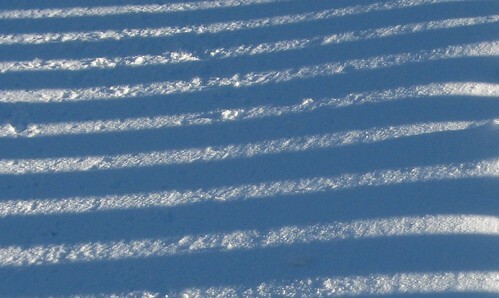 snow stripes, originally uploaded by jahansell. What color is snow? I could have color-corrected this shot in many ways - yellower, bluer - and it would still have looked like snow to you. I don't think the stripes looked quite as blue to me when I was looking at the actual scene as they do here. Soon enough, the snow turns grey with the soot of passing cars - even here! But for today, it's still pure...what color is that, again? cool pic....in more ways than one!